In using the index, note that the place name given for a person’s residence may be a source of confusion. As one visitor to this website pointed out, it all depends on where the place name falls within the geographical hierarchy of place names. The Netherlands consists of twelve provinces. The provinces are made up of municipalities (gemeente). The municipalities, in turn, are made up of one or more communities, each referred to as a plaats (city), dorp (town), stad (city), or streekdorp (region, village). As an example, the village of Haulerwijk is in the municipality of Ooststellingwerf, which lies in the province of Friesland. Further complicating matters, the same name may appear at different levels. Take, for example, Groningen. There is a City of Groningen, located in the Muncipality of Groningen, which, in turn, is in the Province of Groningen. When reading the helper file of someone who aided an Allied airman, keep in mind that the helper (or the typist with Allied Military Intelligence who typed the form) may have used the name from one level of the geographical hierarchy, which might not be what someone else would use. I have a comment about the list of dutch helpers.. I miss my father on this list, his name is dierks.m.j. and he has got the medal of freedom grade 4 without palm in 1947 in maastricht.I hope you can put him on the list. Your father is on the list. 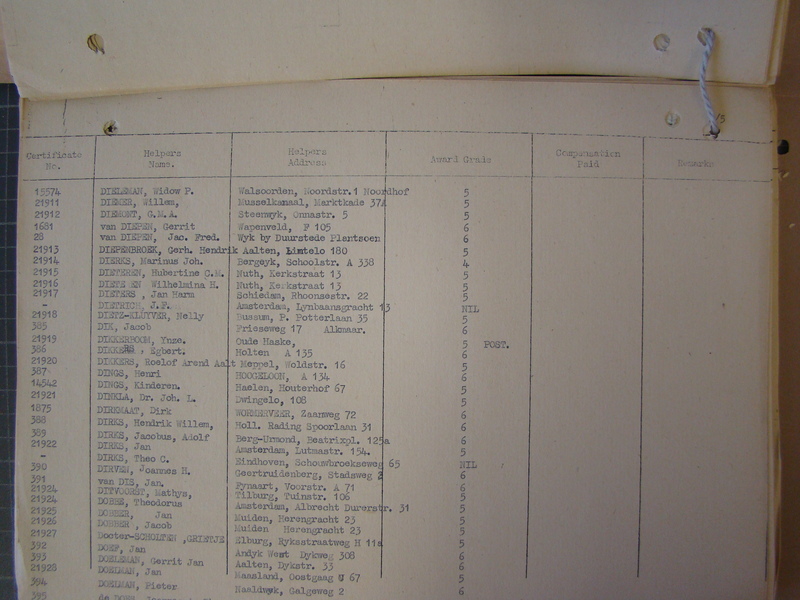 In fact, he is on both the British list at https://wwiinetherlandsescapelines.files.wordpress.com/2012/05/d5.jpg and the American list of Grade 4 recipients at https://wwiinetherlandsescapelines.files.wordpress.com/2015/09/dutch-grade-4a.pdf.